Ask fellow campers about "Green Caye RV Park" and nearby attractions. We stayed in Green Caye for one night while passing through town. We found this park clean with friendly people, especially the staff in the office. The sites have concrete and are close together however this was again just an overnight stay and not a camping experience. There is some construction going on directly in front of the campsites so it was a bit noisey during the day. Overall, this was a perfect place for us to stop. We camped at Green Caye RV Park in a Motorhome. Went to office to check in. Marie was there, she is owner. Very abrupt with employees and condensending. Lawn maintenance came by cut our sewer line. Went to office with receipts for replacement, get excuse was it shouldn't have been on the ground even though she had pictures of sewer line holders and it shows holes on top as if cut by weed eater. Refuses to pay for new line. I left 5 days early, they refused to refund the time i wasn't there. Claimed can't pro rate. Would rather camp in an open field than stay here again. We camped at Green Caye RV Park in a Fifth Wheel. We stayed here for its convenience to NASA and the Port of Houston. Some of the back-in sites in the rear are more spacious, but we opted for a drive-in site at the front end of the park ... not sardine-can-packed, but fairly narrow ... we've been in parks where it was far tighter. Enough space for a picnic table and a couple of chairs on a concrete patio on which the adjacent site's utilities are also situated. The clientele is a mix of resident RVers and transients ... more of the latter than the former. Most sites are tidy, but there are quite a few strewn about with the belongings of the long-term residents in an unappealing way. Trash is collected from frequently spaced spots with white picket fences around them. The problem is that although the sign says bagged trash only, we saw stuff that wasn't bagged ... pizza boxes, and such. While this is not a destination RV park, we would stay here again if its location fit in with our future plans in the area. Beautiful sunrises over the golf course. We camped at Green Caye RV Park in a Motorhome. NASA is a not-to-be-missed; if your wallet allows, do the Level 9 Tour at Space Center Houston. Green Caye is an interesting place. 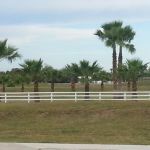 The property is huge with not only a big RV Park, but a lighted par-3 golf course, a mobile home/apartment/condo/townhouse section, and a self-storage. These all exist on the same property but operate totally separate from one another (in other words, no free golf). The RV Park is a mixture of travelers and permanent residents and everything in between. There are many pull through sites and just as many back ins. The pull-throughs are close together, narrow, and long. The back-ins are wide enough for two vehicles to park side to side and deep. The sites and roads are all good concrete. There are no activities, no pool, and the RV park offers no playground for the kids. There is only one bathhouse/laundry. The way the place is laid out, there are many sites a long way from it. People visiting the Galveston side of Houston but not wanting to pay Galveston RV Park prices might want to keep Green Caye in mind. We camped at Green Caye RV Park in a Fifth Wheel. Nightly rate reflects monthly rate of $400. Reservation made months in advance and site assigned. When I arrived the site assigned to me had been given to someone else. A majority of the campers were workers living full time, and very few were RV vacationers. There is a comprehensive list of rules and regulations, but it was very obvious that they were not being enforced as many of the campers were unregistered, needed repairs, were littered outside, etc. in violation of the rules/regulations. The pull through concrete pads are narrow (pre slideout), cracked, and poorly patched, as are the roads in that area. WiFi service is very bad. The riding mower operator threw grass clippings and other debris six feet high against the sides of my motor home which has full body paint. There were also many minute dings and chips from the debris. After 3 trips to the office, the "owner" of the park arrived to look at my motorhome. She appeared to be very disinterested in what had happened and said the grass clippings were thrown against my motorhome by the wind not by the lawn mower. There is no way the wind, which was less than 5 mph that day, could throw grass clippings from the ground to a height of six feet, unless during a hurricane or cyclone. We camped at Green Caye RV Park in a Motorhome. Mostly permanent residents in this trailer park, with very few RV'ers, therefore we would not call it an RV Park. Pull through sites have narrow concrete pads which are cracked, and poorly patched, as are the roads in that area. Many sites are unkempt with unregistered trailers in disrepair, with items, trash, etc, stored under/around the trailers. Vehicles are parked on the grass, and sticking out in the roadways. There is no specified pet walking area so watch where you walk on the grass. Don't plan on sleeping past 5:30 or 6 am as the workers are on their way out. WiFi is virtually nonexistent and there is no cable TV. We camped at Green Caye RV Park in a Motorhome. Nightly rate reflects monthly rate of $400. The nicest thing about this park is the monthly rate includes electricity. The park is very large. This is a gated community, however the gates are kind of random. There are also rental house and mobile homes here. It was quiet. Most of the people staying here are long term. The Wi-Fi is iffy. Sometimes it works great, and other times there is no service. There is no cable TV, however, you can get 5 or 6 local channels. It is pet friendly. Nice place to stay close to Galveston and Houston. We camped at Green Caye RV Park in a Motorhome. This is a GREAT park. Very family friendly and has a great club house, clean showers, and a fabulous golf course and fishing holes. We camped at Green Caye RV Park in a Motorhome. Green Caye is a unique place. Besides offering RV sites, it also rents trailers, homes and condominiums. These dwelling are populated by what appear to be full-time residents, so the periphery of the RV area is adjacent to these residential areas. While this creates few problems, there is the frequent din of vibrating base notes from automobile amplifiers as the local teenagers travel to and from their residences in the community. The entire park is new and well kept. When I visited, a large project involving the planting of palm trees along the roadways was in progress. Unlike most other RV parks, each site has its own garbage receptacle which is emptied every weekday morning. The Wi-Fi access was so poor that I usually resorted to my Verizon card. There is no cable TV connectivity, but the local network channels are available over the air. Surprisingly for an operation of this size, there is no booklet offered at check-in with park rules, local attractions, etc. Rather a single sheet map with a site map and rates is all that is provided. Be careful when entering the park, particularly with motorhomes having vehicles in tow. If one follows the directions on the park’s website, one is directed into a narrow roadway that is blocked by a gate. Do not pull up to the gate. Rather turn left alongside the office / convenience store. This is the unmarked holding area for arriving visitors. Pulling up to the gate will block traffic and necessitate backing up to enter the park. The security gating in the park makes it very inconvenient to travel through the roadways to access the laundry. We camped at Green Caye RV Park in a Motorhome. We stayed for a week while visiting the Houston, Galveston area. Only 25 minutes to either city. Park is well kept as maintenance people are always doing something. Great place to stay away from the big city and close to attractions, only 9 miles to LBJ Space Center. We would stay here again. We camped at Green Caye RV Park in a Fifth Wheel. This is the cleanest park we have stayed in. Friendly people and great location. Just a mile off the main highways. No road traffic noise. Would stay here again. We camped at Green Caye RV Park in a Travel Trailer. We stayed here for a month while we worked on our house that we are selling. It is pretty quiet and the people here are friendly. We did have one problem with a loose pit bull that belongs to a resident, but I tied him up. We camped at Green Caye RV Park in a Fifth Wheel. I was going to stay at Bay RV Park and leave my trailer there for the weekends, but I was so displeased with the appearance of the managers there. I found this great RV park with wonderful amenities and decided to stay. Green Caye is wonderful clean, people are nice, the bathrooms are great with tubs to sit, soak and relax. They have a golf course, laundry room, video store, store, WiFi. I think everyone should stay here at least once. We camped at Green Caye RV Park in a Fifth Wheel. We discovered Green Caye after having a bad stay at Bay RV Park. This is a beautifully kept park, very clean. The spaces are large; each space has a picnic table and trash can that is emptied each day. There is a par-9 golf course next door which only enhances the park. We stayed here a week and will return. We camped at Green Caye RV Park in a Motorhome. Are you affiliated with Green Caye RV Park ?